The SI (Supplemental Instruction) Comparison report is used to compare student visits to course grade. The SI programs primarily focus on peer-assisted study sessions for historically difficult courses. For more information about Supplemental Instruction programs, visit http://info.umkc.edu/si/ . Although this report was created for SI programs, any institution uploading grades to their Trac System can use its function of comparing student visits to course grades. We are happy to assist in setting up this powerful report for your campus. This report is intended to provide information based on one specific course and section at a time. You may also configure this report to search multiple courses at one time which will allow you to view a broad scope of students visited versus students who did not visit your center and the GPA received. This will pull all visits for courses that begin with ‘ESL12000 ‘ (notice the space). In this case, we wanted to make sure our lab courses (ESL12000L) are not included. Usually, only the lecture course is used for this report. 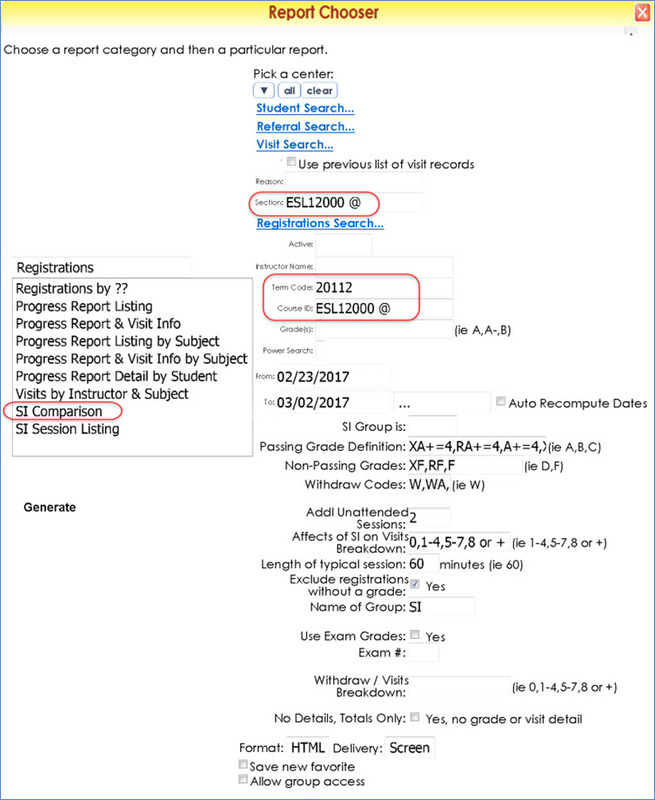 So, make sure the filter criteria exclude the lab or recitation course names. This will pull all courses that begin with ‘ESL12000 ‘ (notice the space). In this case, we wanted to make sure our lab courses (ESL12000L) are not included. For complex grade values (not beginning with an A, B, C, D or F), define the value of each grade using the ‘Passing Grade Definition’ and ‘Non-Passing Grades’ fields. Otherwise, the numeric value of each grade will be assigned by the first letter. If grades are more complex, define their numeric value. List withdraw codes. For example: W,WA,I. If there were SI sessions that no one attended, then put that number here. There is also a built-in way to keep track of all SI sessions offered. Have a fake student with a last name of ‘*SI Non’. Enter in a visit for each SI session offered. This will allow the report to pull in how many SI sessions were offered. Adding a grouping for 0 visits helps in troubleshooting the report.